If you venture in any direction around Sukhothai’s center, you’ll be surrounded by enchantments. 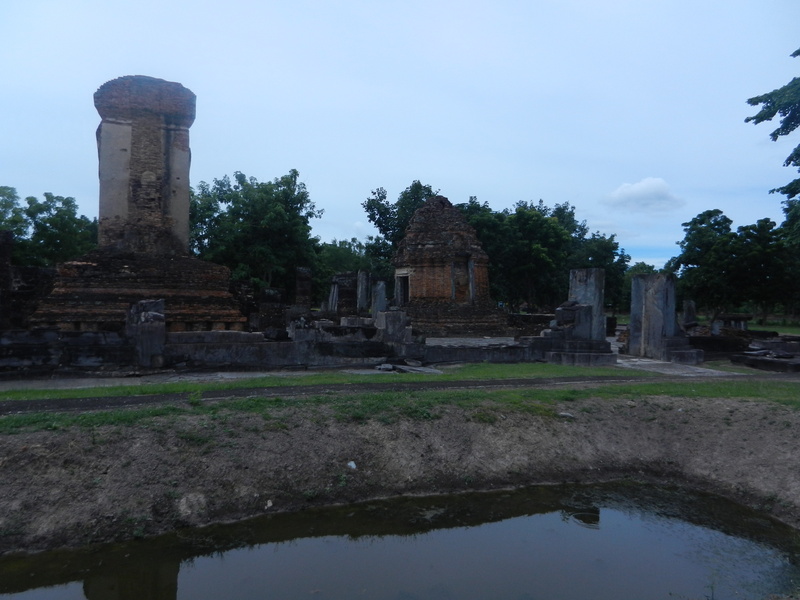 The temples I found in all four made Sukhothai one of the most beautiful places I’ve seen. We’ll explore a couple on the south side in this post. 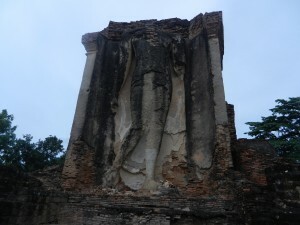 The above shot is of Wat Chetuphon. It was established by 1417–the same decade when the Florentine sculptors Lorenzo Ghiberti, Donatello and Nanni di Banco fashioned their statues on Orsanmichele, which helped inspire Renaissance artists to focus on the material body within a 3 dimensional space. Italian sculptors were moving towards Michelangelo’s David, but Thai artists were developing other idioms to integrate their world. Wat Chetuphon is surrounded by two moats, and the alternations of water and buildings distribute the perspective around the whole environment, rather than focus it on one body and its details. The perspective is more mellow than analytical. Wat Chetuphon does have a center though. The above mandapa is also the tall building in the first shot. 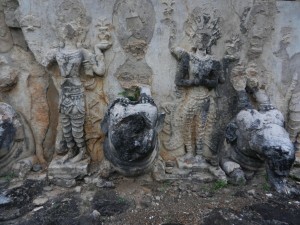 Four stucco sculptures of the Buddha bestow grace in each of the cardinal directions. Each figure’s in a different pose. 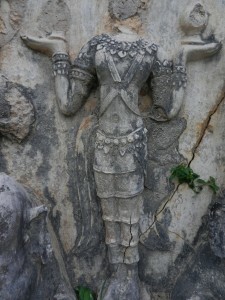 The best preserved is the Walking Buddha (above). Instead of fashioning a massive male body with sunkissed beefcake like Italian artists did, Sukhothai sculptors made figures that glide as gently as a cloud. Instead of concentrating the perspective on distinct objects, Thai artists thought in terms of benevolent flows of energies throughout the whole area. They blended blessings from the Buddha with older folk beliefs about the land’s energies that generate life. Those energies were just as gentle across the road, at Wat Chedi Si Hong (above). It was also built around the beginning of the 15th century. When the little shrines around the middle stupa were new, a procession around them made their forms flow as gently as the waters around Wat Chetuphon. The stucco carvings around the stupa’s base added even more lilt. Deities alternate with elephants. 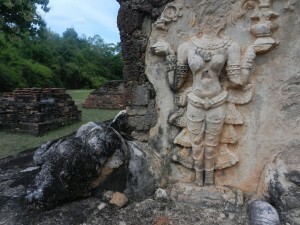 The divinities have four arms. Two hold their palms together, and the other two hold up vases with flowers. These vessels symbolize life and prosperity. The sculptures sport different costumes, and Dawn Rooney thought that people might have worn them around Sukhothai’s court back in the day. Some of their costumes ripple as playfully as Wat Chetuphon’s reflections in the moats. Nothing commands the attention around these wats. 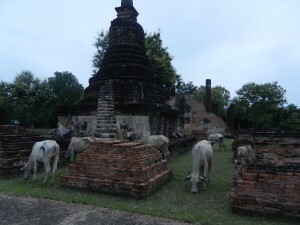 The east side of Sukhothai is just as lissome. So is Sukhothai’s center. The more you meander around the area, the more gentle forms you find that reflect the Buddha’s compassion and tamed life-force. 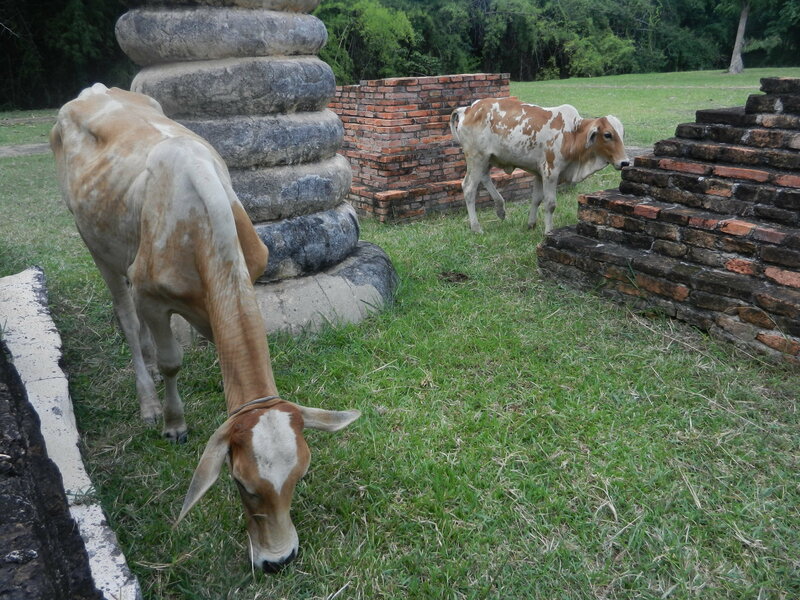 Cows placidly grazed around Wat Chedi Si Hong as I enjoyed its sculpture. We all seemed to merge in the gentle flow of life.